Rich, buttery and slightly salty- this easy method for perfect pan fried brussels sprouts with ghee will turn anyone into a brussels believer! Brussels Sprouts are one of my favorite fall indulgences. I’m not sure why they get such a bad rap sometimes- because I absolutely love the salty, caramelized bits when brussels are cooked well. The secret to perfect, never-bitter, savory and salty brussels? Ghee! 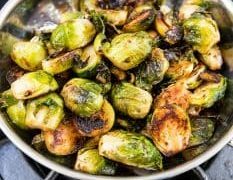 These Pan Fried Brussels Sprouts with Ghee are a fabulous side dish for any fall meal- and they were a huge hit at the recent Farm to Table Fall Harvest Dinner I held with Megan from Freckled Italian and La Crema Winery in Windsor, California at the amazingly gorgeous Saralee Vineyard. 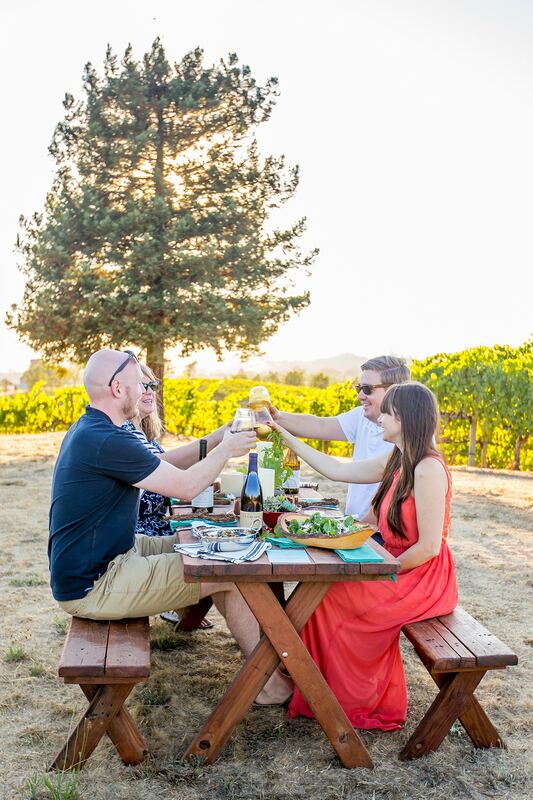 Harvest is such an important time to winemakers as they collect the grapes they have nurtured all summer long in hopes of stunning wines in the years to come. 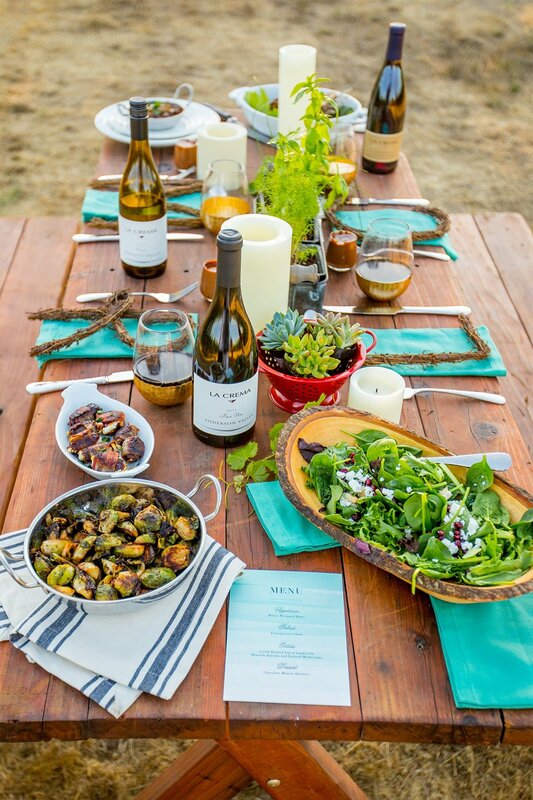 We couldn’t let such an important season pass without a little celebration, so we threw a gorgeous, intimate dinner party with a menu designed to bring farm fresh ingredients home so you can host your own special meal celebrating autumn! Since eating in a fresh, local, and sustainable way means finding foods that are in-season, I knew one of our spotlights for our farm to table harvest dinner had to be brussels sprouts. Brussels Sprouts are a late harvest crop- and often are harvested through the fall and into winter. As grapes are being picked from the vines, brussels are just coming into a productive fall season. Brussels are a great choice for fall dinners, in to the winter. They also can be a spring crop, but aren’t much of a hot-weather staple. Brussels Sprouts pair well with both white and red wine, which is really important to me at wine dinners, because you want to be able to have dishes that work with your guests who might not have worked entirely through their main course yet. 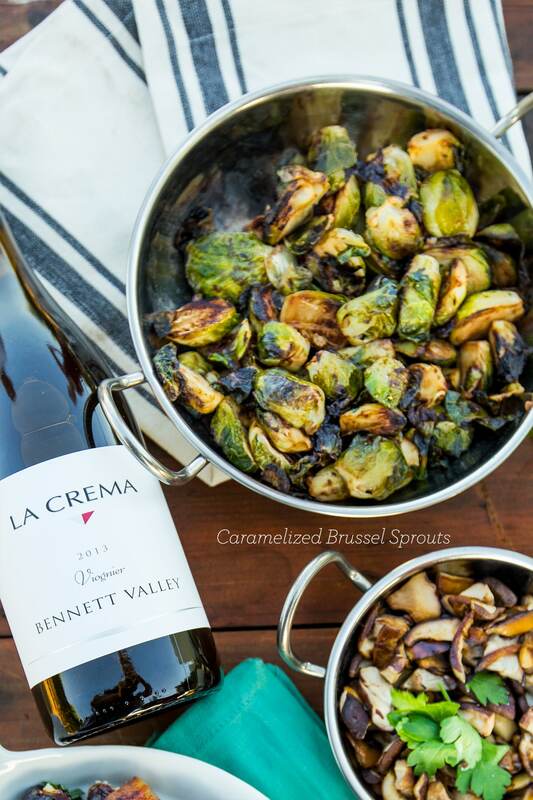 We paired our brussels with La Crema’s Monterey Pinot Gris and Monterey Pinot Noir. The hints of lemon and honeysuckle in Monterey Pinot Gris are a fantastic way to cut the salty flavor of the brussels sprouts; and the plum and cocoa notes in the Monterey Pinot Noir enhance the rich, meaty flavor of caramelized vegetables. -Let them caramelize! Color is flavor. Giving your sprouts lots of time to develop a dark, caramel color will dramatically cut down on the bitterness many people associate with unpleasant brussels sprouts. -Cut them in half! After you cut off the hard base of the sprout, I like to cut them again in half to add to the surface area. 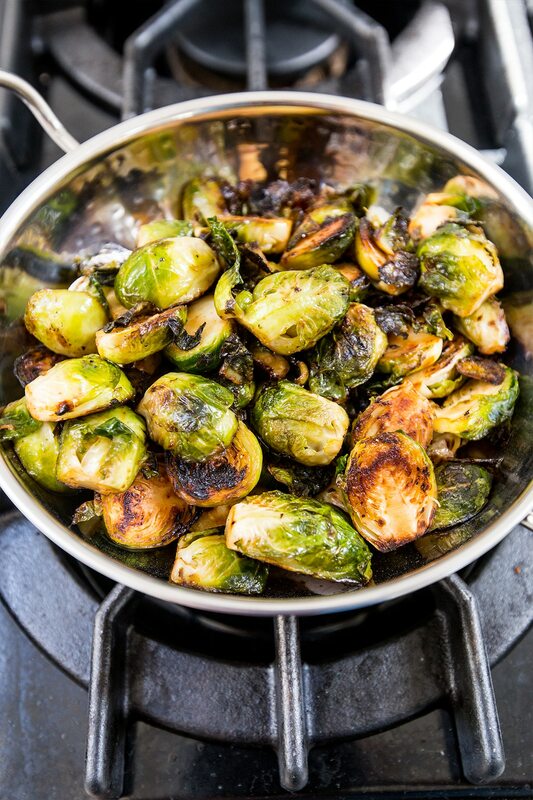 This allows brussels sprouts to get even more crispy, crunchy, buttery flavor! -Don’t be afraid of ghee. It has a funny name, but ghee is just a type of clarified butter. And trust me- once you go ghee, you never go back. It gives food a salty, buttery flavor and has a higher smoke point than butter. It is my secret to delicious vegetables, every time! Rich, buttery and slightly salty- this easy method for perfect brussels sprouts that are never bitter will turn anyone into a brussels believer! Add pan to high heat. When ghee is melted, add in brussels. Be careful when standing near pan- they can pop and splatter a bit when giving off moisture. 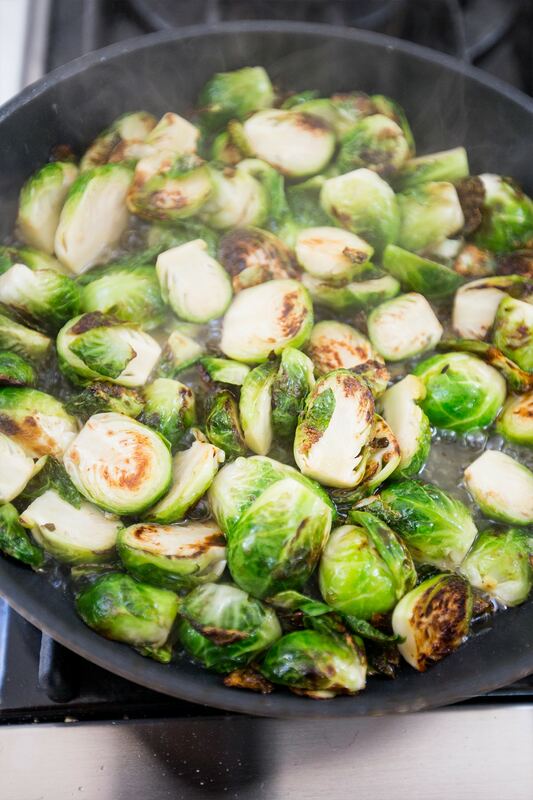 When brussels sprouts are lightly browned, deglaze pan with wine. Let wine cook off, and taste. Cook until brussels are soft. Everything looks so good & yummy brussel sprouts. Pinned & shared. Thanks for joining in the Inspiration Spotlight party. Hope to see you at the next party. You had me at Ghee!! I just love cooking with it. It makes excellent Indian desserts. Found your blog at the blog hop. You have an awesome space. I stopped by from Thursday Favorite Things. I love Brussel sprouts in any shape and form. These look amazing! Thanks for joining the Thursday Favorite Things Blog Hop! Word cannot describe how much I ADORE this! Gaaaaaah you have posted my love food. I am obsessed with brussels sprouts and you’ve made them look a-mazing!!! YUMMY!